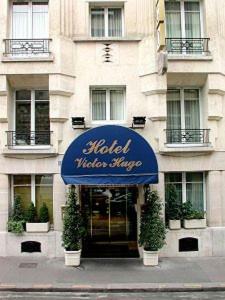 Best Western Victor Hugo, Paris discount hotels and accommodation. The lovely Victor Hugo Hotel is a charming, first class property located in the beautiful,romantic city Paris' prestigious 16th district: Enjoy the quietness of this privileged district and have a walk on the nearby ChampsElysées, Eiffel tower and Tocadero Gardens.This family hotel combines traditional elegance and confort, and the warm welcome will make you have a very pleasant stay.The 75 rooms and bathrooms entirely renovated offers highest comfort such as, air-conditionning, safety box, mini-bar, satellite TV, pay TV, tea & coffee facilities, internet access and furniture Louis XVI manufactured by Masters cabinetmakers, in the French tradition. In some superior rooms release in the bath-tub jacuzzi. You will appreciate the cosy atmosphere and take time to discover the books of Victor Hugo in the library of our bar and have the buffet breakfast served in the indoor patio. View photos, room descriptions and make online reservations at Best Western Victor Hugo. Save on room prices at Best Western Victor Hugo, Paris.